Let me start off by saying that I am picky about literature set in the Victorian period. Often it comes across as very stuffy. This is not the case with this book. Veronica Speedwell is the main character. After the death of her “aunt”, her life is suddenly turned upside down. She is almost abducted. Baron Maximilian von Stauffenbach convinces her that she is in danger. He also tells her he knows who her mother was and promises to tell her all. He places her with a friend named Stoker. Unfortunately before he has the chance to give her any information he is murdered. Veronica and Stoker flee in an effort to find the truth. They are to stay ahead of those trying to find them by joining a traveling circus, friends of Stoker’s. Veronica and Stoker have a very strange relationship. They seem to take pleasure in making digs at each other. Veronica is definitely able to stand up for herself. She is very confident. This isn’t something you often see in females in the Victorian era. I loved her sarcasm. I loved how flustered Stoker would get because Veronica was not like other women of the time period. She would actually speak her mind and expect Stoker to accept it. This is the beginning of a romance. 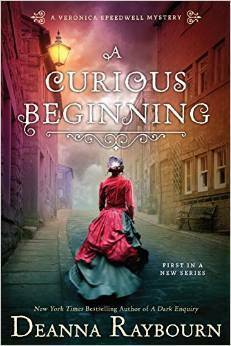 I liked the fact the author deviated from the normal Victorian romance. There are secrets from Stoker’s past that aren’t resolved in this book. This leaves the reader anxiously waiting for the next book in this series. This is a great start to this series.